The follow-up to their hugely successful ‘Sikhs in the City’, which toured throughout 2004, the story of ‘Soul Sikher’ is almost the exact reverse of the earlier show. 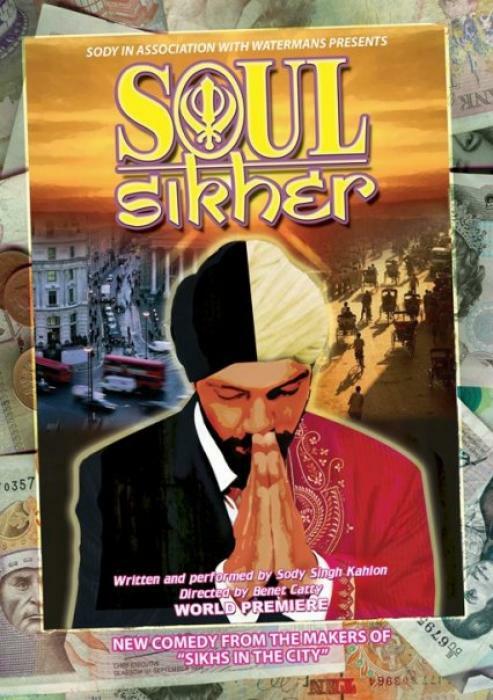 Where ‘Sikhs in the City’ followed a Sikh man struggling to shake off the strictures of his religion and be true to himself, ‘Soul Sikher’ is the story of a man who has long since lost his religion and who is forced to confront the life he has lead when fate intervenes. Paul (aka Palwinder) works for Ingram Norton Technology Corporation (INIT) and has landed them another major account. But, not for the first time, the credit and the commission is handed over to his white colleague by his racist boss. Meanwhile he's also having troubles at home with his devout wife getting increasingly distant and his colleagues at work clearly not being the friends he claims them to be. When he's told to “go home” to India to close a deal, his distractions lead to a fatal car accident. The second act, in India, all takes place in his head as he imagines the journey he might have gone on, and finally confronts his faith in the moments before his death. Throughout his journey, we meet the eccentric and extraordinary characters who guide him on his way and who are Sody Kahlon’s trademarks, including his sister, a lecturer, a tour guide, and a mosquito. The whole thing is held together by extensive use of multi-media, developing further an ingredient which was a major part of ‘Sikhs in the City’. ‘Soul Sikher’ opened at Watermans in late September 2005 where it received near-unanimous rave reviews, and toured until the summer of 2006.